Rice cooking is one of the daily routines. To get rice with perfect flavor, you need the best rice cooker and quality rice. It’s quite easy to find the best rice cookers on the market, although there are many things to consider. 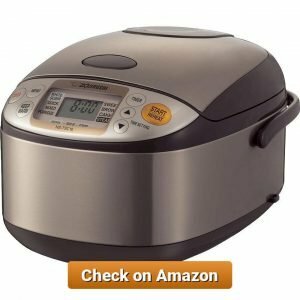 So, what is the best rice cooker on the market today? Check out our recommendations, we have selected 10 rice cookers from hundreds of models based on user reviews. They have bought it and give an opinion about the product. Check our recommendations for the best espresso makers! If we’re talking about the best rice cookers 2018, we must be talking about a cooker that does it all. The Instant Pot DUO60 can be one of the contenders. This kitchen essential has many features a rice cooker has to offer. From pressure cooking or yogurt making, the Instant Pot DUO60 really does it all. Even though you need some practice to get hold of this appliance, approximately 4,000 satisfied owners claim that the versatility that you will get is worth all the effort. 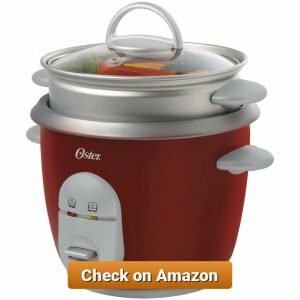 With 14 built-in smart programs (soup, meat/stew, bean/chili, poultry, sauté/simmer, rice, multigrain, porridge, steam, slow cook, keep warm, yogurt, manual, and pressure cook), this kitchen ‘gadget’ is one of the sophisticated electric pressure cookers that you can get at an affordable price. The inner cooking pot is six-quart stainless steel made from food grade materials to make sure that heat is distributed evenly, and it is also fully sealed so flavors, nutrient, and aromas are kept within the food. Built with the latest third generation technology and 10 different mechanisms for your safety, your favorite food is only one-click-of-a-button away. Instant Pot DUO60’s built-in safety features include safety lid lock, pressure regulator, smart detection of leaking lid, anti-blockage vent, lid position monitor, automatic pressure controller, excess pressure protection, automatic temperature control, high-temperature monitoring, as well as electric current and temperature fuse. 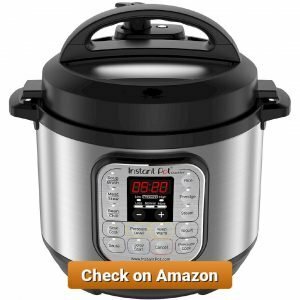 A lot of online reviewers say that the Instant Pot DUO60 is a huge time saver. You can make yourself some meals faster because this cooker cuts down cooking time by up to 70%. If you’re a busy person, you can cook your rice, soup, beans, or chicken with just one click and you can go out and about without having the risk of ruining your food. It is also energy sufficient and versatile so you can use it to prepare your meals almost every day. If you have a small kitchen, this multifunctional cooker will save you countertop space because you won’t need seven different appliances. It is also very easy to clean the stainless steel is dishwasher friendly. Despite its multifunctional features and benefits, some users claim that Instant Pot DUO60 does not provide a comprehensive instruction manual. It will take some experience and experiments to best utilize the cooker. Also, because this is a versatile appliance, the control panel has a lot of buttons and settings and it can be overwhelming to some users. Another thing is the sealing ring of this cooker tends to absorb odors. Worry not because the solution is quite simple. You will only need to buy an extra sealing ring so you can use one for bland foods and the other one for aromatic foods. The Instant Pot DUO60 is perfect for you if you want to have a complete range of kitchen appliances but doesn’t have the space to store them. It is also for you if you are someone who values time and convenient cooking. Nowadays, people are opting for convenience and versatility more, and that is why a lot of people choose electric pressure cookers to prepare their meals. The Instant Pot DUO80 is one of the top rice cookers 2018 that you wouldn’t want to miss in your kitchen. The main appeal of this kitchen gadget is its versatile functions and large capacity. You can rely on it to cook your rice, sauté your vegetables, and even make your yogurt. Built with the latest third generation technology and cutting-edge safety mechanisms, catering for your whole family is just as easy as pressing a button. The Instant Pot DUO80 is a pressure cooker, slow cooker, rice cooker, steamer, sauté, yogurt maker, and warmer, all in one appliance. The Instant Pot comes in different quart sizes, but the DUO80 offers an 8-quart model which is popular for holding the most food. The Instant Pot DUO80 speeds up cooking time by two to six times and it requires up to 70% less energy. With latest third generation technology, the microprocessor of this cooker helps monitor pressure and temperature, as well as keeps time and adjusts the heating intensity to make your desired meals. The healthy, stainless steel 8-quart inner cooking pot can hold up more portions so it is very convenient for cooking larger meals. The material is food grade 304 with no chemical coating. The bottom of the inner cooking pot helps even out the heat distribution, and the pot is fully sealed so flavors, aroma, and nutrients are trapped within the food. The Instant Pot DUO80 features 14 smart programs: soup, meat/stew, bean/chili, poultry, sauté/simmer, rice, multigrain, porridge, steam, slow cook, keep warm, yogurt, manual, and pressure cook. The Instant Pot DUO80 is UL and ULC-certified and it has 10 safety mechanisms to ensure that you cook your perfect meals safely and to help eliminate many common errors in the kitchen. Many satisfied customers believe that the Instant Pot DUO80 is the perfect match for their kitchens. 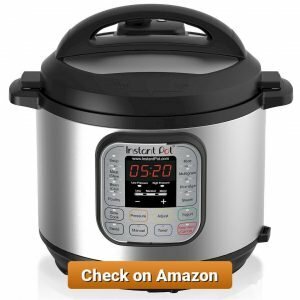 The body of the Instant Pot is sturdy and it does not leak or make any loud noise. It means that the Instant Pot DUO80 is a very reliable and durable kitchen appliance to be used in your everyday lives. The programmable features and settings help you diverse your cooking, and it can make your food tender and delicious. It also comes with a recipe book that is very helpful. The 8-quart inner pot can cater to more portions, so you can just simply use the cooker to create enough food for your family gathering or any kind of special occasion. There’s not much to say about the cons of this cooker, except for the size of it. Unlike the previous version of the Instant Pot, the DUO80 can definitely take up more space on your countertop. 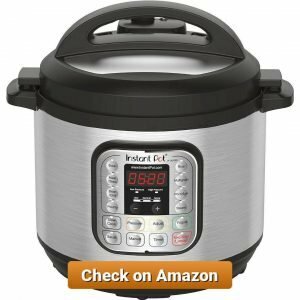 The Instant Pot DUO80 is perfect for you if you have to cook for a lot of people on a regular basis. However, if you have a small family, the size of this cooker may not be as convenient to use, but it’s still perfect for family gathering. Multitasking is a skill that is admired by many people, and Aroma Housewares 8-cup cooker will help your multitasking ability. The appliance gives you the opportunity to professionally cook rice and steam vegetables at the same time. The Aroma Housewares ARC-914SBD is one of the top rice cookers 2018 which has a generous capacity. It can cook up to eight cups of rice with specific functions for white and brown rice. With its minimalist and compact design, this rice cooker is a perfect fit for your kitchen countertop. As one of the top contenders of rice cookers, the Aroma Housewares ARC-914SBD offers a simple kitchen appliance that’s very easy to use on a daily basis. It has several interesting features to look forward to. The Aroma Housewares ARC-914SBD can hold up two to eight cups of cooked rice. The product comes with a measuring cup that you can use to perfectly measure the amount of uncooked rice that you will cook. This generous capacity will let you cook for your entire family in one go. In addition to cooking rice, the Aroma Housewares ARC-914SBD also a perfect cooker to steam meat and vegetables, and the best thing is, you can cook your rice and steam your vegetables at the same time. The cooker is also great for soups. The programmable digital controls of this cooker are easy to use and it is equipped with automatic “Keep-Warm” as well as “White Rice” and “Brown Rice” functions. It also has 15-hour delay timer if you wish to have flexible meal planning. So, if your schedule is tight, you can cook rice in the morning to serve it fresh for dinner. This rice cooker’s inner cooking pot is made from a surgical-grade stainless steel 304 which will maintain the flavor and aroma of your rice. You will also steer away from any hygienic issues so your food will be as fresh and healthy as it should be. The Aroma Housewares ARC-914SBD is very lightweight and doesn’t take too much space on your countertop, but it doesn’t mean that the body is fragile. The body of this rice cooker is quite sturdy, and it is very easy to clean. The greatest thing about this rice cooker is the simplicity of it. The control panel doesn’t have too many options so you can easily cook your white or brown rice and steam your meat or vegetables without feeling overwhelmed with the buttons. The instruction booklet is also very easy to follow, and it has instructions on how to cook rice and clean the cooker. The Aroma Housewares rice cooker also comes with a measuring cup and there’s also water level measurements on the inside of the pot so you will get the perfect rice-to-water ratio. Despite its durable stainless steel inner pot material and its simple control panel, the Aroma Housewares ARC-914SBD, unfortunately, doesn’t have a feature for slow cooking. Even though the capacity is quite generous, many believe that it still cannot cater for a big group and the beeping sound may sound a bit loud for some people. The Aroma Housewares ARC-914SBD is a perfect cookware for you if you live alone or have a small family. Due to its simplicity, this appliance is also a great fit for you if you are a first timer in using a rice cooker. The Instant Pot Duo Mini 3 is one of the best rice cookers 2018. The 3-quart cooker can replace seven kitchen appliances, combining the functions of a rice cooker, pressure cooker, slow cooker, steamer, sauté, yogurt maker, and warmer. With its smart built-in programs, you can make your favorite dishes by easily pressing a button. What makes it great is that the Instant Pot Duo Mini 3 is a versatile appliance that you can use at home or bring with you when you’re traveling. The Instant Pot Duo Mini 3 has 11 smart built-in programs: rice, soup/broth, meat/stew, bean/chili, sauté, porridge, steam, slow cook, yogurt, keep warm, and pressure cook. By using the rice cooker function, you can cook all types of rice, from white and brown rice, to sushi rice and risotto. The maximum capacity of this cooker is 6 cups of uncooked rice and 12 cups of cooked rice. To make sure you get the perfect measurement, you can use the included rice measuring cup. The cooker features up to 24-hour delay start and an automatic Keep Warm function of up to 10 hours. It gives you the flexibility of cooking your rice so you can cook your rice in the morning to enjoy it at dinner time. This feature is perfect for fast and flexible cooking. You can cook with both high pressure and low pressure. High-pressure cooking reduces cooking time by up to 70% and low-pressure cooking avoids overcooking your delicate food. The healthy, stainless steel 3-quart inner cooking pot is made from food grade 304 materials with no chemical coating. It is also dishwasher friendly. One of the main advantages of owning the Instant Pot Duo Mini 3 is the small size of the cooker. It’s perfect for a small kitchen because it won’t take too much space. Some bloggers even say that the Instant Pot Duo Mini can be easily used in an RV. You can also bring it when you’re having an excursion or camping. The size is also perfect for cooking side dishes when you don’t want to have a lot of leftovers stuffing your refrigerator. Not only that, since it has a small size, the cost for the cooker is also much cheaper than the regular one so it gives you a more affordable option if you want to give the cooker as a gift. Even though the mini 3-quart size of this cooker gives plentiful benefits, it also can give you a disadvantage, especially when you have to cook for larger meals. If you have to cook a whole chicken or cater for 10 guests, the cooker will definitely be too small. The Instant Pot Duo Mini 3 is the ideal companion for small families and people who live alone who doesn’t need to cook a lot of meals. The small size is great for you if you have a small kitchen. It’s also perfect for travelers. The Aroma ARC-150SB won’t be one of the top rice cookers 2018 for no reason. This cooker can cook rice, soup, and stew flawlessly, and you can even steam vegetables and cook rice at the same time with no hustle. Due to its generous capacity of 20 cups of cooked rice and the superb water reservoir, you’ll be wondering what did you do to deserve this great cooker with such affordable price. With a simple control panel, all you have to do is put everything you want to cook inside the cooker and let the Aroma Housewares ARC-150SB do all the work. If you just don’t have enough time to monitor your cooking, this cooker can let you set the delay for up to 15 hours to cook your rice from the moment you turn on the program. This will make sure you get a hot and perfectly cooked rice when you get home for dinner. Most high-end cookers today have too many options on the control panel, and sometimes, the users feel overwhelmed with it. However, you can intuitively figure out what you want to do with this cooker. The designated buttons for each function is clearly labeled and a red light will appear to confirm your selection. 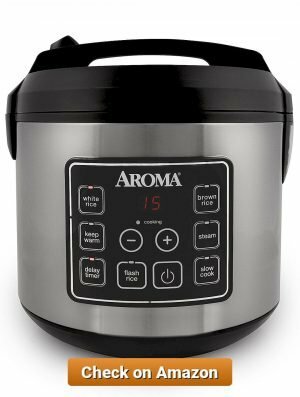 The Aroma ARC-150SB is a rice cooker, slow cooker, and steamer in one single appliance. You can rely on it to cook various kinds of rice, steam vegetables or meats, and slow cook your food. The slow cooking can be set from 2 to 10 hours. When the cooking is done, it will automatically switch to the warm mode. The cooker features a non-stick bowl and cools to touch body which can be easily cleaned. Most parts of the cooker are dishwasher safe and the body can be easily cleaned with a damp cloth. The cooker can cook 10 cups of uncooked rice to make 20 cups of perfectly cooked rice. It will be perfect to use when you have to cook a large batch of rice to cater to your guests or family. Most users say that the greatest thing about the Aroma ARC-150SB is the fact that this multifunction cooker is easy to use, unlike the others. With stainless steel material and other amazing features, this cooker is extremely affordable. Even though it won’t cost you too much gold, the construction of the body is still sturdy, so you don’t need to question the cooker’s dependability. It’s also a great cooker for multitasking because it can cook rice and steam vegetables simultaneously. The capacity of the Aroma ARC-150SB is perfect for cooking in a large batch, and the inner pot has a clear measurement so you can perfectly measure how much rice you want to cook. One of the cons that you need to consider is the fact that some users experienced a big mess on their countertop when cooking brown rice, so you may need to soak the rice first before cooking it. This cooker is suitable for bigger families or if you have to cook a large batch of rice on a daily basis. It’s also perfect for people who opt for the multitasking functionality of a kitchen appliance. Cooking healthy meal should be easy for everyone, including for busy people. 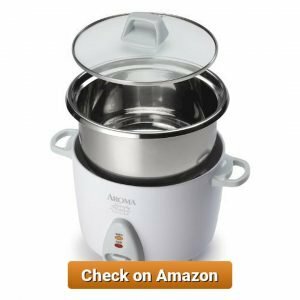 Aroma Simply Stainless is one of the best rice cookers 2018 to cook the nutritious meal with easy switch flips. This all-in-one cooker is great to prepare warm meal anytime, perfect for a single household or small family. The rice cooker can cook two to three cups of uncooked rice, resulting in four to six cups of cooked, steamy rice. The size and portion are perfect for a small to the medium-sized household. Aroma Simply Stainless has surgical grade stainless steel for its inner pot. The pot is removable and can be washed easily. One-touch operation switch is perfect for cooking and warm foods with easy flips. The light indicators will show when the cooker is cooking (red) or warming (yellow). Warm is the default mode, and the Cook switch will go back to Warm when the rice is cooked. The rice cooker comes with a measuring cup and spatula, making it easy to cook and serve the rice immediately. The rice cooker can cook not only rice, but also soup, chili, jambalaya, oatmeal, porridge, and other one-pot meal types. Perfect for easy, home-cooked foods every day. Some rice cookers have a non-slip coating that peeled off after a while. Aroma Simply Stainless has a stainless steel plate that does not make the rice sticking to the bottom. Aroma Simply Stainless is a perfect appliance for a small kitchen. The dimension is 8.1 x 8.2 x 10.3 inches, making it easy to be placed on the table or countertop without wasting too much space. The stainless material also makes the cooker light. The rice cooker has hard plastic handles, but the rest of the structure is solid. The lid is made of glass, and the handles are screwed. Cooking brown rice requires more water than white rice. Aroma Simply Stainless can only cook two cups of brown rice because of the extra water. The cover of this rice cooker has a small vent hole. Cooking rice with maximum capacity may cause the hot water to spill out a little from the hole. The “stainless” part of this rice cooker is not solid but plated. The interior may look cheap after a while, and may not be satisfactory for homeowners who wish for a premium product. Aroma Simply Stainless ARC-753SG has a compact size, easy control switch, and quite sturdy design for a product from affordable range. This rice cooker is perfect for a small to medium family, an individual person, or couple who wants quick but nutritious home-cooked meal every day. If you look for the best rice cookers 2018 with easy control and compact design, Aroma Simply Stainless ARC-753SG is one of the best products from the affordable range. Smart rice cooker with multipurpose features is an ideal option for busy but health-conscious people. Zojirushi NS-TSC10 Micom is one of the top rice cookers 2018 that offers cooking, warming, steaming, and even baking functions. The easy control panel and convenient design make cooking healthy meal easier. Zojirushi has several cooking settings that can be used to make various meals, such as cooking, steaming, warming, quick cooking, and baking. Fuzzy Logic is a smart technology that makes the cooker able to adjust with various rice types, setting the on and off time accordingly. The smart feature is activated by thermal and weight sensor, which tells the differences between white rice, brown rice, porridge, and such. This rice cooker has detachable parts that make it easy to wash. The detachable parts include the inner lid, steaming basket, and cooking pan. The rice cooker has user-friendly LCD control panel that displays functions such as cooking, warming, timer, and clock. The rice cooker comes with several accessories, such as spatula and its holder, measuring cup, and manual book, complete with recipes. One Zojirushi rice cooker like this one can make a lot of things, such as white rice, brown rice, sushi rice, porridge, oatmeal, soup, chili, bread, and even cake. The cooker has separate cake setting, so you can bake easily without guess works. Different types of rice have different rice/water ratio in cooking. The cooker’s manual has information on several rice ratio types. This will help you cooking fluffy white, brown, jasmine, Basmati, and sushi rice easily. The cooker has a smart system with microchip, melodious alarm, and a sensor that will not let your foods go soggy or burnt. As long as you set the cooker properly for the food type, you can leave it right after turning it on. The “Keep Warm” function in this rice cooker is decent, but some users have reported spoilt rice when they left the rice more than one day in it. You may want to quickly eat the rice after cooking it. The cooker may be able to cook various rice types, but the cooking time may be a bit longer than regular rice cookers. The inner pot of this rice cooker is a bit thin, and the layer may peel a little after long use. Zojirushi NS-TSC10 Micom is perfect for a small to the medium-sized family that frequently cook rice. This rice cooker is also great for busy people who want warm, home-cooked meals without troublesome steps. Rice cooker can be a savior for anyone too busy to cook various hot meals. Zojirushi NS-TSC10 Micom is a top rice cooker 2018 perfect to make nutritious foods every day. Cooking a small portion of a personalized meal does not need to be monotone. Oster 4722 is one of the best rice cookers 2018 for cooking rice and simple pot meals for one to three diners. Compact and user-friendly, this cooker is ideal to make rice and side dishes in quick, convenient steps. Oster can be used cook up to six cups of rice, using three cups of uncooked rice. The rice cooker is also perfect for other pot-type meals, such as soup, oatmeal, and chili. The rice cooker has a separate steaming basket to steam vegetables, roots, or side dishes. The steaming tray has one liter of capacity. It also has food warming option to keep the meal hot. The control panel of Oster is easy, consists of two light indicators (Cooking and Warming), with an on-off switch. The cooker has removable cooking pot, steaming tray, separate rice paddle, and measuring cup. All of them are easy to wash and dry. The pot and tray are all made of metal, without any hints of plastic parts (except for the rice paddle). Oster has 9.2 x 10.2 x 9.5 inches of dimension, with the compact design that fits on small countertop or dinner table. The red color and metal parts make this rice cooker trendy enough for any kitchen, even a small apartment or urban home. Oster is great to cook various rice dishes, such as paella, steamed chicken rice, and coconut rice. It is also great to make steamed vegetables and roots, chili, soup, oatmeal, and porridge. When the rice is cooked, the cooker will automatically switch to warm mode, preventing burnt meal. Oster is a small rice cooker, so if you cook rice with its maximum capacity, water often seeps through the vent hole on the lid and creating a mess. While warming mode works just fine in this cooker, warming rice too long can leave some hard, crusted brown rice on the bottom of the pot. Users must always remember to unplug the cooker as soon as the rice is cooked if they don’t immediately eat. The cooker comes with the cooking guide, including rice/water ratio. However, the small capacity requires users to make their own adjustments for the best results (especially for cooking brown rice). Oster 004722-000-000 is great for individuals, couples, or small families that do not require abundant portions. The cooker is compact but useful, perfect to make quick, warm, nutritious meals every day, even for the busiest homeowners. This is also great for students or temporary homeowners who need small but multipurpose equipment for the kitchen. If you need a compact, convenient rice cooker for individuals, couples, and small families, Oster is one of the best rice cookers 2018 you can get. Cooking healthy foods is often troublesome for busy people. Some also think that healthy meals are complicated. 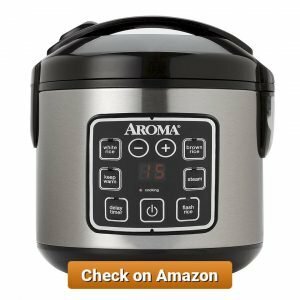 Aroma Housewares ARC-743-1NG 6-cup Cooker and Steamer is one of the top rice cookers 2018 designed for cooking quick, healthy meals. Big capacity, easy interface, smart features, and powerful steamer make this cooker perfect for healthy meals in short time. The rice cooker has simple, one-touch control panel. There are two light indicators that show Cook and Warm functions. The cooker can steam while cooking rice. The steamer function is great for vegetables, meat, eggs, and roots (cassava, sweet potato, taro). Tempered glass lid making it easy to look inside. The rice cooker can cook up to three cups of dry rice, to become six cups of rice. The portions are perfect for individuals, couples, and small families. All parts of the cooker, such as the cooking pot and steamer basket, are detachable and dishwasher-safe. The rice cooker comes with rice measuring cup, spatula, user manual, and simple recipes. The rice cooker is great to cook white, brown, black, and Basmati rice, as well as whole grains like quinoa and oatmeal. The cooker can also cook soup, chili, porridge, and jambalaya. Add steamed meals, and healthy foods are ready every day. The cooker’s dimension is 10.4 x 11.1 x 8.1 inches, perfect for small house and dorm room with limited cooking space. The cooker can detect when the rice is done, so it will automatically switch to Warm. Your food will not get burnt. If you leave the cooker in Warm function too long (without unplugging), the base of the cooking pot may get thick with the rice crust. Some users complained about rice water or froth spillover, which makes the top part of the cooker dirty after a while. The key is to pick 2.5 cups as your maximum dry rice volume to cook, instead of three. Also, the dry rice must be washed repeatedly until the water is no longer murky. Some users reported fragile steamer parts, especially if they are handled a little roughly. Make sure to handle the steamer parts gently, and be careful when inserting it on top of the cooker before putting in the foods. Aroma Houseware ARC-743-1NG 6-cup Cooker and Steamer is perfect for individuals, couples, and small families who want to eat healthy every day but have little time to cook. The cooker is also good if you often make lunchbox and want to have freshly-made lunches every day. Eating healthy is no longer a difficult work, even if you work every day. 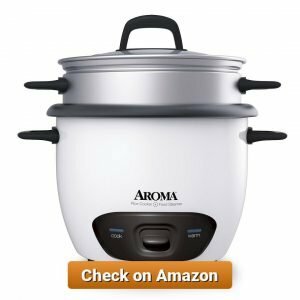 Aroma Houseware 6-cup Cooker and Steamer is one of the top rice cookers 2018 for quick and warm nutritious foods. Cooking for a family is a hard work to do, but you can cut the job short using the right equipment. Aroma Housewares ARC-914D 8-cup Digital Rice Cooker is one of the best rice cookers 2018 for family-sized meals. The cooker has steamer function, digital features, and enough capacity to feed a standard family. The rice cooker can be used to steam foods simultaneously with cooking. The steaming basket can be used for vegetables, meat, roots, dumplings, and many more. The rice cooker has 15-minute delay timer feature, which helps you making warm meal ready at the right time. After the rice is cooked, the cooker will automatically switch to warm mode, keeping the food from burnt out. The rice cooker has an on-off button, which enables you to turn off the cooking process without unplugging (like cheaper models). The rice cooker has more diverse buttons than cheaper models, with specific ones for white and brown rice, cooking, warming, and steaming. This rice cooker comes with a rice-measuring cup, rice spatula, soup ladle, and user guide with simple recipes. The rice cooker has a large capacity that is perfect for a family. You can cook four cups of dry rice grains to get eight cups of cooked rice. The rice cooker is great to cook all types of rice (including brown and black rice), soup, chili, jambalaya, rice dish, oatmeal, porridge, and other types of pot-type meals. The rice cooker has stainless steel body that looks elegant and sleek. The steaming tray is made of the BPA-free material, making it perfect for health-conscious families. The rice cooker has separate functions to cook white and brown rice, but you may need to experiment a little with rice/water ratio for brown rice. Some users reported that using the default brown rice cycle only created lukewarm water. Special white rice types, such as Basmati, tend to get undercooked when you just follow the instructions. Just like brown rice, you may need to experiment with rice/water ratio. The rice cooker has a loud alarm, which can be troublesome for little houses or dorm rooms. The cooker also has no clock, like regular microwaves and some rice cooker models. Aroma Housewares ARC-914D 8-cup Digital Rice Cooker is perfect for a medium-sized family who needs to cook the warm meal every day. The cooker is also perfect if you want to cook with various ingredients, but do not want to spend too many hours in the kitchen. Cooking warm, nutritious meal every day is no longer difficult, even if you have a family. 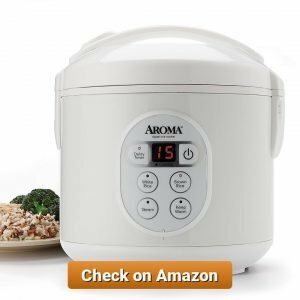 Aroma Housewares 8-cup Digital Rice Cooker is one of the best rice cookers 2018 to create warm, diverse, healthy meals every day.